Hi friends! I hope you're having a wonderful day! We are doing ok over here. It is hotter than hot where we live! We are spending the day indoors and maybe later we will take Parker out to celebrate his birthday because his celebration got cancelled when our van broke down in a major intersection on his birthday. He had to spend the majority of his day waiting for a tow truck. Poor guy! Today, I'm writing about this awesome new program I'm trying for Raley's grocery stores. It's a completely free program called Try-It where they give you coupons and free samples so you can (you guessed it) try it. If you have Raley's in your area, I would HIGHLY suggest you sign up because who doesn't love free stuff? Seriously. You can sign up HERE. The first thing we got to try is the Top-It Pizzas. For signing up for the program, we got a 50% off coupon for this, a free pizza cutter, and a few $1 off coupons. The concept is that there are plain cheese pizzas and then you can get a topping kit to top it yourself. 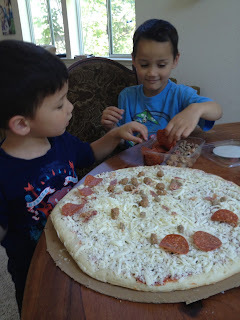 We picked the 4 meat topping which has pepperoni, sausage, ground beef, and bacon. The pizza was a nice size at 16 inches. My kids had a great time adding the toppings! It's the perfect way to have the kids help with dinner. It's fun and you can teach them about fractions and whatnot. 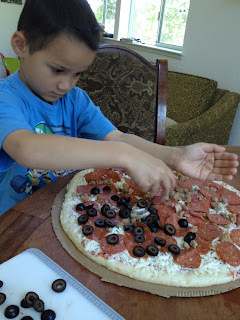 The kids wanted olives on the pizza too so I grabbed some from the cupboard. My husband doesn't like olives so I told them they could put them on half. This next picture is Brady using his arm to show half the pizza. After we topped the pizza, we baked it up and I couldn't even get a picture before people dug in and started eating it. It was a very tasty pizza. The crust got crisp on the bottom and stayed chewy on the inside. There was TONS of pepperoni which is great. I just wish there was more of the other kids of meat too. We ate most of it and the leftovers the next day were good too. I will definitely be using my coupons and buying more of these pizzas! I hope that someone local can benefit from this post either by signing up for the program or finding a fun new dinner idea. Have a great day, friends!